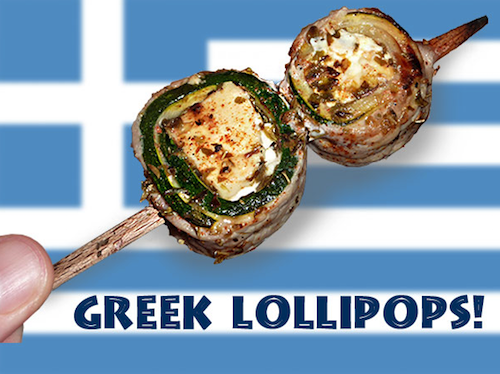 Greece (or its politicians) may not be particularly popular these days, but Greek food is great, and so are these barbecue “lollipops,” inspired by the country’s cuisine. 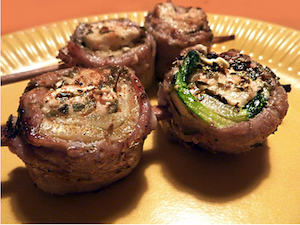 This recipe is a classic in German BBQ forums (I believe credit may go to Thorsten in Wesel). 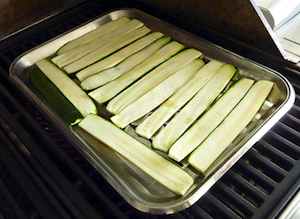 It goes like this: Brushed with olive oil, thinly sliced zucchini strips are softened on the grill. 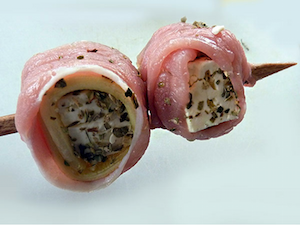 The strips are then wrapped around feta cheese cubes that were dipped in a mix of oregano and other spices. Make the mix as spicy as you like! Finally, the packages are tightly wrapped with thin strips of lean pork, fixed with a skewer, then grilled to perfection. 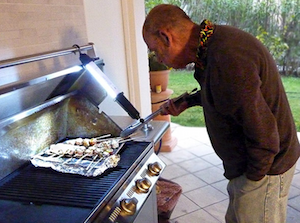 I made these when Dave and his wife Mary Jane came visiting us in Bardolino, Italy in the spring of 2015. 1. Cut the two zucchini into thin 1” wide strips, brush with olive oil and grill just long enough to become a little soft and flexible. 2. 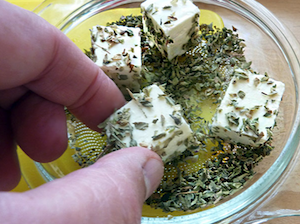 Cut feta cheese into 1” cubes and roll in oregano (or a mix of oregano and red pepper flakes). 3. Tightly wrap the zucchini slices around the spiced feta cubes. 4. 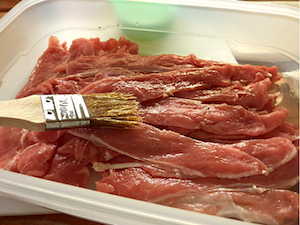 Cut the lamb or pork into thin slices, also about 1” wide, brush lightly with olive oil. 5. Wrap the meat strips tightly around the zucchini/feta packages. Place instantly two packages each on a skewer (when wooden skewers are used, soak these in water first, for about 30 minutes). Optional: Dust with your favorite barbecue rub or spice mix (Cajun mix makes a good match). 6. Lightly brushed with a little olive oil, place the “lollipops” on a medium-hot grill with direct heat for about 15-20 minutes. 7. 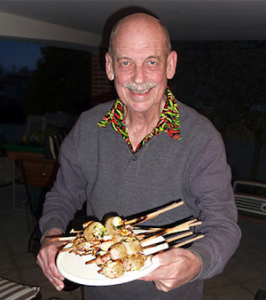 Invite Dave and have him occasionally turn the skewers to brown all sides. 8. Ready: Crunchy outside, with a cheesy, chewy center. Serve with tzatziki and bread. Enjoy! In a small bowl, whisk together about one cup low-fat yogurt, 6 tablespoons peeled and finely chopped cucumber, 1 clove crushed garlic, a few drops of lime or lemon juice, and a tablespoon freshly chopped dill. Season with salt & pepper. Refrigerate until serving with the lollipops.